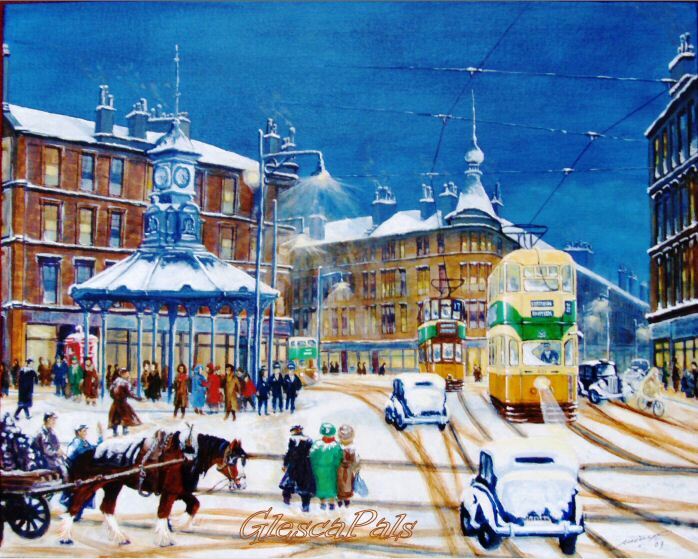 “Winter at Bridgeton Cross – 1950’s” is an original composition based on my other painting, “Bridgeton Cross, Glasgow, 1955”. It is painted using acrylic on canvas board measuring 508 x 406 mm (20” x 16”). The painting is protected by a two coats of gloss varnish and was signed and dated by the artist, William M. Neilly, in February 2009. Looking southwards beyond the “umbrella”, Dalmarnock Road is to the left from which a number 46 motor bus from Castlemilk enters the Cross. A motor vehicle emerges from Main Street behind the number 26 tramcar, en route to Scotstoun via Partick. James Street, is located to the right of the taxi which is adjacent to Cockburn the Chemist and behind the pedal cyclist. The number 17 tramcar on the left is about to enter Dalmarnock Road en route to Cambuslang via Farme Cross. The snow covered cars heading south have entered the Cross from Orr Street. The traffic policeman stops the flow of all traffic to enable pedestrians to cross over to the umbrella and also the slow moving horse and cart to cross over to the correct side of London Road, having just entered the Cross from Olympia Street. 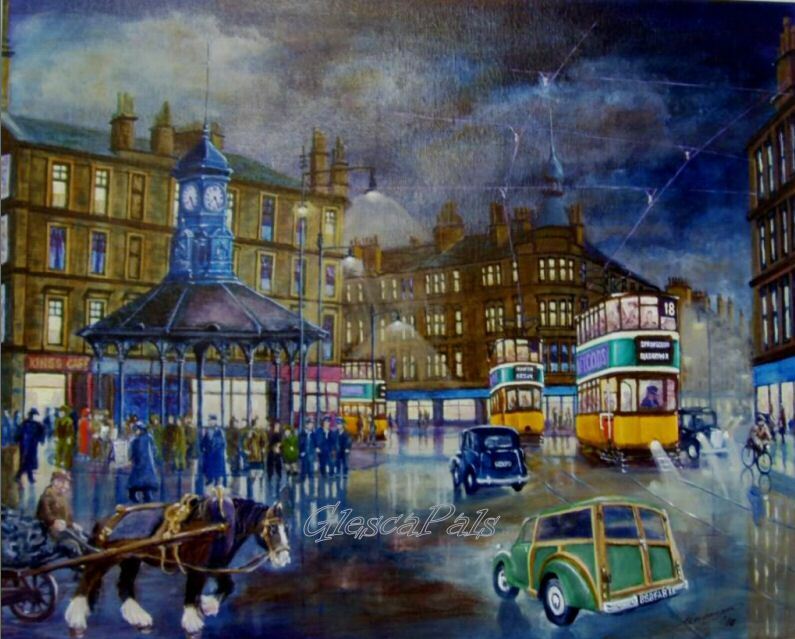 The coalman and his horse and cart are heading along London Road towards the Calton. 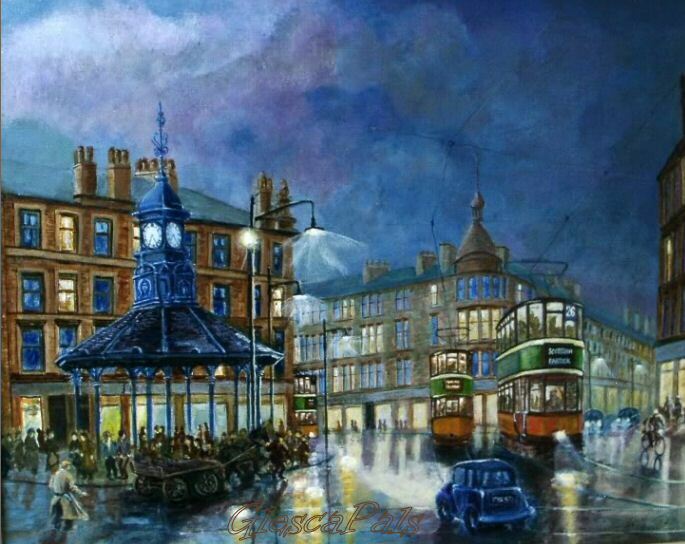 "A wet wintry night at Bridgeton Cross"
Looking southwards, Dalmarnock Road is to the left beyond the Umbrella with Main Street to the right of the number 26 tramcar enroute to Scotstoun via Partick. The tramcar on the left, number 26A, is en route to Shawfield via Main Street, Bridgeton. James Street is located to the right of the two motor vehicles, entering the cross from Main Street at Cockburns the Chemist. The number 106 trolley bus travelled from Millerston to Govan along James Street. The Carter is heading towards the coal depot in Dalmarnock Road located between Dalmarnock Tollhouse, at Springfield Road, and Dalmarnock Railway Station.